The brown recluse has six eyes. The legs are uniformly colored and covered with fine hairs. The legs have no stripes, banding, or spines on them. The abdomen is also uniformly colored. Also see this article which states the recluse has been found in eight counties in FL. "Recluses are occasionally found [in Florida], sometimes a population, but they are exterminated" -Rick Vetter, personal communication, 7/9/2011. The egg sacs are attached to a surface--see this photo. The Brown Recluse is very shy and nocturnal, therefore most likely encountered at night when it is foraging for food. During the day the brown recluse hides in secluded places. An interesting fact is the brown recluse cannot bite through clothing because of its small fangs. Most brown recluse bites result in only a small red mark and heal without serious complications. The bite of the brown recluse is usually painless and many go unnoticed for as long as 2 to 8 hours or the victim may feel a stinging sensation later followed by intense pain. A small white blister develops at the site of the bite, followed by swelling of the area. This swollen area enlarges and becomes red. The site becomes painful and hard to the touch. A necrotic lesion develops and the affected tissue dies and slowly sloughs away exposing the underling tissue. This necrotic ulcer may persist for several months and heals slowly, leaving a sunken area of scar tissue. It is exceedingly hard for a physician to correctly diagnose a "brown recluse bite" based simply on the wound characteristics. In very rare cases, the bite may result in a systemic reaction accompanied by fever, chills, dizziness, rash or vomiting. Gertsch, W. J. & Mulaik, S. (1940). The spiders of Texas. I. Bulletin of the American Museum of Natural History 77: 307-340. 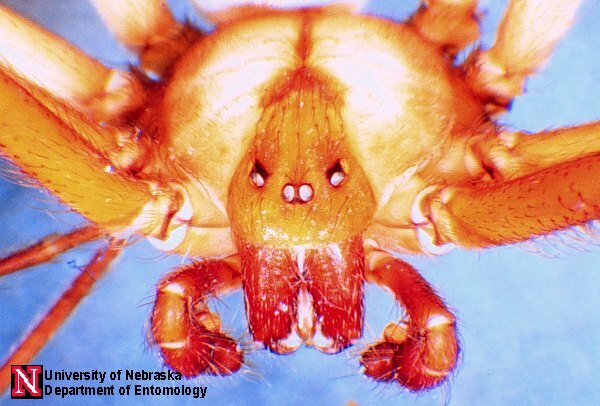 “Commonly Encountered Pennsylvania Spiders” Covers several spiders found throughout the U.S.
University of Florida Extension Service: A detailed discussion about the Brown Recluse and spiders often confused for the Brown Recluse. Convenient culprit: Myths surround the brown recluse spider: A discussion, especially, of the over-diagnosis of Brown recluse bites. W. Mike Howell and Ronald L. Jenkins. 2004. pearson education. Vetter, R.S. & D.K. Barger. 2002. Journal of Medical Entomology 39 (6): 948–951.